One of the alien species from the Eden Paradox series I most get asked about is the Spiders. These are referred to in the first book (The Eden Paradox), then their name crops up again in book two (Eden's Trial), and they become of interest since they were believed extinct, but somehow managed to escape eradication by the Q'Roth. In book three (Eden's Revenge) the suspense climbs further because they are patronized by the most intelligent being in the galaxy (Kalaran), though nobody knows why. 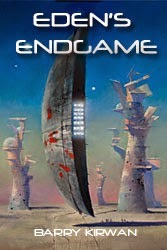 So, it is with some pleasure that I finally get to show what they are about, and the role they get to play in the galactic war in the final volume of the series (Eden's Endgame). 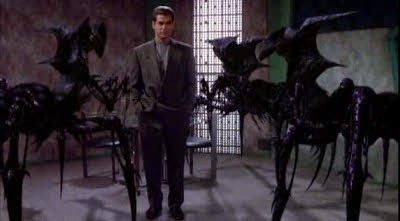 I'm not actually very fond of (Earth-born) spiders, and I freely admit I found the 'Shadows' from Babylon 5 (pictured) a bit unnerving, as they were pretty 'Spider-esque' and nasty as well. In the Eden Paradox series the Spiders almost start becoming endearing - but, as you're about to read, that stops at book 4. One of the recurrent themes in my books is that aliens are not humans in other shapes or forms, they really are different in nature. Throughout Eden's Endgame, this is more apparent for the Spiders than any other race. Louise stopped at the first Raptor holding thirty human captives from the raid on Esperia, all perfectly still, frozen in stasis. She’d been away from her fellow Alicians for so long, and had known nothing of the Plight: genetically-upgraded Alicians had barely been able to breed since Earth’s demise, and needed a steady influx of DNA from their human predecessors. The irony of the situation wasn’t lost on Louise. Alicians had twice tried to wipe out their genetically outdated cousins, only to discover that without them they would perish within a generation. The unmoving humans were huddled together like a pack of frightened goats. Like Sister Esma before her, she’d prefer to be rid of them. Humanity had squandered its chances, and as far as she and other Alicians were concerned, had long ago forfeited the right to exist. But for now – and the next fifty years – a few would be kept alive in order to replenish Alician society. Qorall’s armada sweeping across the galaxy would eliminate the rest of humanity back on Esperia. Her gaze settled on two of the women at the front: Antonia and Sandy. She reckoned their leader, Micah – responsible for Sister Esma’s death and her own missing arm – still cared about these two. Good; he’d come to Savange on a fool’s errand to rescue them, and she would finally be able to kill him. She hated long goodbyes. Could these humans have stopped a Q’Roth Battlestar dead in Transpace? No. She exited the first Raptor and walked quickly to the identical short-haul transporter next door. Inside the second storage cell a single large black Spider hung upside down, its four legs clamped to the ceiling. Wires and tubes smeared with blue blood hung in loops from the Spider’s flattened cylinder body, and fed into a console. One of the two remaining Alicians, a tall male of fair complexion – Jura, she recalled – manned the console and pored over the latest readouts. Jura didn’t know what was happening to the rest of the ship, and Louise wasn’t about to distract him from his task. His baritone voice soothed her. She’d missed Alician contact. Eighteen years away from her people, most of it spent with alien species who bore no resemblance to her own kind; aliens often stank, were visually repulsive or else grated on her ears. A human corpse was strapped to a nearby chair, the deceased woman’s face streaked with sweat and tears. Louise thought while Jura talked. Qorall wanted one of these Spiders at all costs. He, like his Kalarash enemies, was from another galaxy. Qorall was currently winning the war, but what if the Spiders were also from another galaxy, a secret weapon brought here by the Kalarash aeons ago? Evidently these Spiders could influence space and Transpace without technological aid. That was unique as far as she knew. But she wanted to know more before she handed over this prize to Qorall. Louise ignored the dead woman and stared at the Spider. The Q’Roth believed they had eradicated the Spiders centuries ago, yet now they flourished again on Esperia, sharing that dustbowl planet with humanity. They looked docile, but no one except the Kalarash knew their purpose and their capability, and now one of them had stranded a Q’Roth Battlestar in Transpace. The most important currency in the galaxy had always been information. But she was running out of time. “Send in borers,” she said. Louise said nothing. It had to die anyway, she was convinced of it, to free the Battlestar. But this was her last chance to understand this species, and a dead but intact Spider would still be of considerable value to Qorall. Jura nodded, and went to fetch the burrowing micro-cameras. “I saw nothing,” Louise lied. “This is an anomaly, nothing more. When it ends we will wake up on arrival at Savange.” She spoke with complete conviction; Alician leadership required overt self-assurance. Yet Kaarin was right; all species experienced Transpatial travel as instantaneous. That didn’t mean it was. The Spider didn’t want to be taken to Qorall, and had somehow snagged them in mid-flight – there were no stars outside – and had opened up a vortex that would kill them all. They would disappear without any trace. Seven minutes. At four she’d have to kill it. Jura returned and injected the Spider with six borers at equidistant locations around its body: they would navigate their way through it, chart the Spider’s anatomy and neural activity, and then invade its brain. The Spider’s legs tensed, then began to shiver. Blue blood spattered onto the metal floor, like the first heavy drops of rain in a brewing storm. Jura returned to his console. Louise joined him, looking over his shoulder, his face reflected in the screen where numbers and curves scrolled past. Suddenly his eyes went wide. Louise felt the familiar chill – like a sudden ice breeze – of entering Transpace. Every surface, every line on Jura’s face, every hair, turned silver and froze, as did everything else Louise could see, including her own hand resting on his shoulder. She could no longer move. This was all expected when travelling through Transpace, except she should have been unconscious. She guessed the Spider was dying, but not yet dead. She wondered if Jura and Kaarin were conscious too, but she had no way of knowing. She heard a thud as the Spider dropped to the floor amidst the sounds of wires and tubes ripping from its flesh. It hobbled over and stood next to her, its soft fur brushing against her thigh. Its communication band, dark until now, lit up, and a focused beam of amber light swept over the console. When the beam shut off, all the complex analyses and data had disappeared from the screen. The Spider leant against Louise, then tilted its body, and one of its legs kicked with ferocious speed at Jura’s head. Louise heard his neck snap. She would have gasped if she’d been able. From all she knew, what she’d just witnessed was unheard of. The Spiders had always been peaceful, not even defending themselves when the Q’Roth had culled them. Had the Spiders recently changed in some fundamental way? She doubted it; species rarely changed that much, even over millennia. No, they had been waiting, biding their time, until Qorall arrived. Somehow they were a real threat to him. Louise was glad she hadn’t seen what Jura had gleaned from the data: the price of such information was clearly too high. But the intel that the Spiders could manipulate Transpace, and were capable of extreme violence, would be highly valuable to Qorall. The Spider sagged next to her, heavier than she’d imagined. Something pricked her calf, cold seeping into her veins. The display screen was now silver like everything else, and Louise watched as the Spider staggered away a couple of paces before its legs buckled and it collapsed, its body twitching on the floor in a spreading pool of blood. Good, it was dying, which meant the ship and all aboard would be saved. But what had it injected her with? Even as she thought about what she had just witnessed, and the need to tell Qorall as soon as they arrived at Savange, her mind began to fog. She struggled to hold onto the past few minutes’ events, but they slipped from her memory’s grasp. Louise heard a gurgling sound she presumed to be the Spider’s death rattle, and slipped into unconsciousness.